Sade: When did you start your business? Wonder Curl: I started Wonder Curl in February 2010 with Get Set Hair Jelly as my first product. Sade: How long has it been up and running? Sade: What made you start your own product line? Wonder Curl: I went natural back in 1998 when there weren’t too many products that worked in hair that was thick, coarse and curly like mine. I had a vision of how I wanted my curly hair to look, and I wanted this to last after my hair dried, in the humidity and for my hair style to last a few days. I began researching ingredients and creating my own formulas until I came up with something that I loved. I also wanted to share the products with natural curlies of all textures. 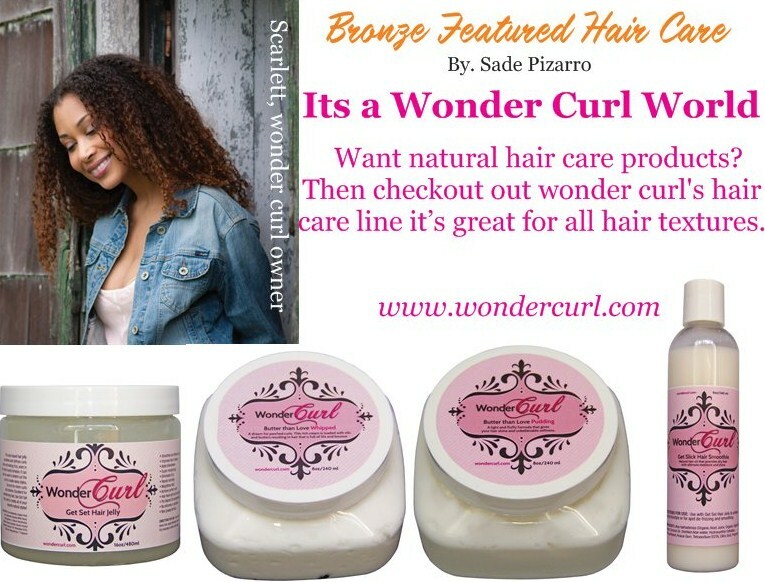 My website is www.WonderCurl.com and the products come in different sizes and are competitively priced. They were recently featured in Hype Hair’s June issue. Sade: What does your product line consists of? b) Get Slick Hair Smoothie – this leave in cream oil moisturizer is absorbed into the hair to help strengthen from within and adding moisture curls love. c) Butter than Love Hair Pudding – this pudding has a light hold and will leave your hair feeling super soft without weighing it down. d) Butter than Love Hair Whipped – this is a thick cream for extra moisture that will seal your hair as well as make it fluffy without any greasiness. e) NEW! Polishing Pomade – the yummiest smelling pomade that melts in your hands for easy distribution throughout your hair to tame fly always and add sheen. Sade: What are the benefits of using natural ingredients in our hair products? Wonder Curl: The benefit to using natural ingredients is that they have been proven by the ages and many cultures to deliver nourishment that curly hair needs. Ingredients such as Virgin Organic Coconut oil (that can be found in Get Slick Hair Smoothie) are also scientifically proven to penetrate and strengthen the hair. Wonder Curl: The benefit to using natural ingredients is that they have been proven by the ages and many cultures to deliver nourishment that curly hair needs. Ingredients such as Virgin Organic Coconut oil (that can be found in Get Slick Hair Smoothie) is also scientifically proven to penetrate and strengthen the hair. Sade: Do you only have to be natural to use your product line? Wonder Curl: Anyone with hair can use the Wonder Curl products. Because the moisturizing products aren’t heavy, they are perfect for helping to protect relaxed hair and the Jelly is great for when you don’t want to blow dry your hair, but rather let it air dry without getting big or frizzy. Sade: What is your daily routine with your products? Wonder Curl: Weekly, I wash and apply the products through my hair and either sit under a hooded dryer or let it air dry. At night, I put into a loose, high bun to reduce friction and protect the ends. In the morning, I shake my hair loose – Voila, all done! Keep up with Wonder Curl on her website www.wondercurl.com for events, promotions and more.